On Survivor Cambodia: Second Chances Season 31 Episode 14, the jury interviews the final castaways and votes on a winner in the season finale. 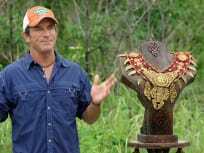 On Survivor Season 31 Episode 13, the survivors once again compete for both a reward challenge and an immunity challenge as another castaway is voted out. "Tiny Little Shanks to the Heart"
On Survivor Cambodia: Second Chances Season 31 Episode 12, another castaway ends up being sent home. On Survivor Cambodia: Second Chances Season 31 Episode 11, two more castaways are voted off as the "voting block" strategy continues to be utilized. 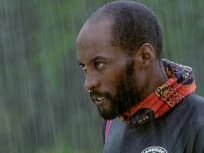 "Like Selling Your Soul to the Devil"
On Survivor Cambodia: Second Chances Season 31 Episode 10, a storm drowns spirits, but a reward challenge offers players a glimpse into the Cambodian culture. On Survivor Cambodia: Second Chances Season 31 Episode 9, a balancing challenge on the water ends with another castaway is voted out of the game. On Survivor Cambodia: Second Chances Season 31 Episode 8, the two teams compete for a reward and one more castaway is voted out of the game. 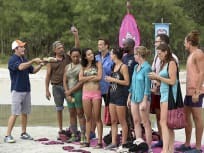 On Survivor Season 31 Episode 7, it's the largest merge ever for the 13 castaways and the first individual immunity challenge is a classic game of balance. On Survivor Cambodia Season 31 Episode 6, the players drop their buffs for a second time and switch tribes and one castaway is pulled from the game. On Survivor Season 31 Episode 5, one player risks ruining a good thing by going against her own alliance while another embraces a new style of play. On Survivor Cambodia Season 31 Episode 4, two players plead for their lives in the game at a heated tribal council after a gut-wrenching challenge. On Survivor Cambodia: Second Chance Season 31 Episode 3, Jeff Probst hands out new buffs as the two tribes are now split into three brand new teams. 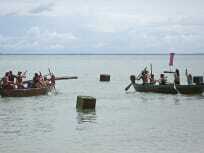 On Survivor Season 31 Episode 2, the teams face difficult new challenges after being voted in while playing the game on the beach in Cambodia. On Survivor Season 31 Episode 1, in Cambodia, these 20 castaways from past seasons were voted for by fans to have another shot at being named "Sole Survivor."